Though it is not strictly magic oriented, it does represent conjuring quite well. I was looking at the list of participating libraries and they include the Harry Ransom Research Center at the University of Texas where a great deal of Houdini owned scrapbooks reside. Also, they list The Senate House at the University of London which contains items from the Harry Price Library of Magical Literature. In addition, they cover Spiritualism, so anyone interested in that topic (NORMAN), might want to delve into it. There is a section on Music Halls, Theater and Popular Entertainment, a section on Circuses, Sideshows and Freaks, and a section on early Motion Pictures. How in depth this is I don't really know yet. I just recently stumbled upon it. But AskAlexander is such a valuable resource that I would have to say this new addition must be great otherwise they would not have included it. I'm assuming you must be a member of AskAlexander.com to access the site. IF you are a member and have not looked into this new resource, please do! From what I have seen so far it will be a great tool when researching our unique art for historical purposes. 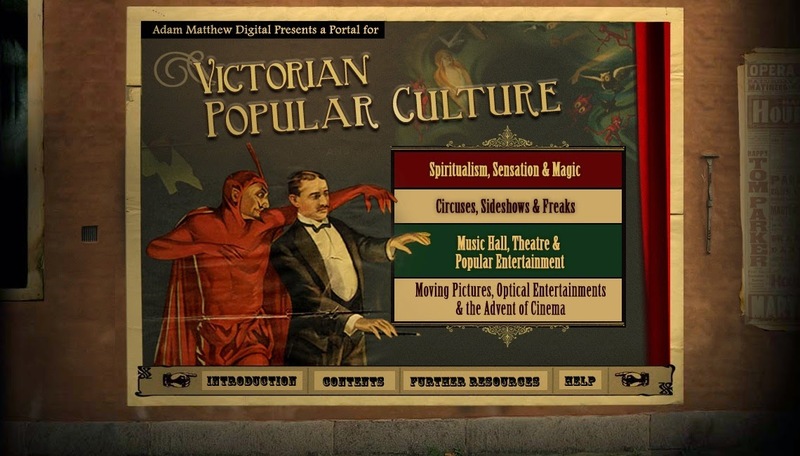 UPDATE: I just discovered this service 'Victorian Popular Culture' is a paid feature. So if you don't have an account/membership with The Conjuring Arts Research Library, you won't be able to view it, sorry. I did not realize that at first. I was able to view it because all Genii Subscribers were able to see it up until June 15th. Needless to say, June 16th, no go! lol. Genii Magazine used to run their online version of the magazine through AskAlexander.com. But now they have gone to their own portal, so it's no longer available for us to access. However, AskAlexander.com does offer very reasonably priced monthly subscriptions to their site so for as little as $10 a month you can view the 'Victorian Popular Culture' portal plus lots of other great research tools offered by AskAlexander.com and the Conjuring Arts Research Library.